Growing up in Mexico City, I didn’t know a single person who celebrated Cinco de Mayo, except for the people who lived in the state of Puebla. We didn’t even get the day off! Sure we studied it in school–the unprecedented victory of a small Mexican militia against the large French army in 1862–but it was a short-lived victory, as the French won right back. Fast forward 150 years to 2012: the French and Spanish are gone; Mexicans proudly celebrate Independence Day every September 16; yet, for reasons few of us can explain, Cinco de Mayo has become the greatest, most joyous, colorful celebration–for Mexicans living abroad. As strange as the nostalgia is, the longer I live abroad, the stronger the impact Cinco de Mayo has within my soul. These words fluff up like soft conchas right out of the oven, getting fluffier, sweeter and more comforting as the years go by. As do so many Mexicans (and, increasingly, non-Mexicans), I celebrate anything that can be celebrated about our Mexicaness: our heritage, resilience, hard-working and accommodating nature, our warmth, hospitality, generosity, the vibrancy and richness of our music, dance and food. Above all, our tendency to tirar la casa por la ventana (to throw out the house through the window) when it comes to throwing a party. Thankfully, as Cinco de Mayo celebrates its 150th anniversary this year, the spotlight is finally being cast on Puebla, the place where that famous battle took place. At last, the celebration that has become the rage beyond Mexico’s borders is coming back to the place where it originated. It’s about time! Puebla is a hidden treasure, a colonial jewel with rich history, architecture, arts and culture, coupled with an exquisite overlay of modernity. Most important, its one of Mexico’s main culinary hubs. Some of our most iconic (and most labor intensive) dishes come from Puebla, born in convents where Spanish and Mexican cuisines wedded so beautifully. There’s the classic mole Poblano, with its layers of complex flavors subtly coming together once in your mouth; and there’s the colorful chiles en Nogada whose red, white and green represents the Mexican flag. Yet Puebla is also home to a bounty of homestyle accessible dishes like the chicken tinga and the corn torte. 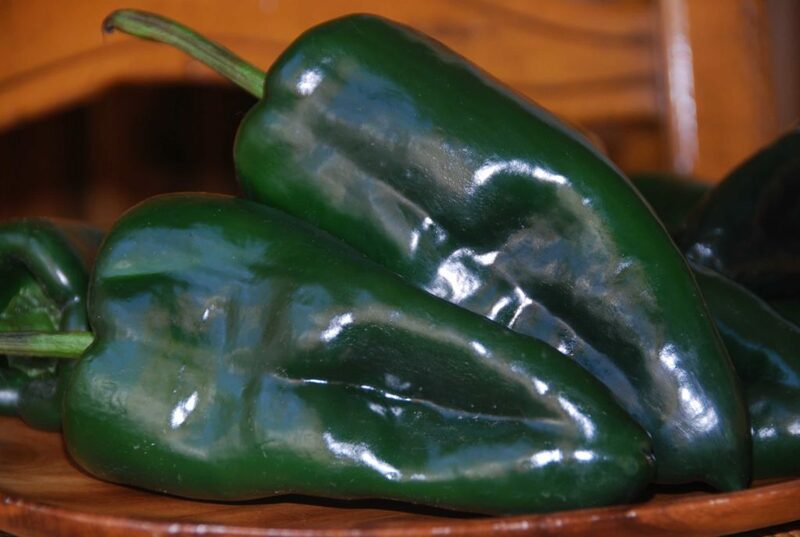 And it’s home to one of my favorite Mexican ingredients: the chile Poblano. See below? That is how many Poblano chiles I go through a week in my house. This key ingredient has never ceased to charm me, from the moment I get it at the store to the moment I taste its exuberant, fruity flavor. It is, quite simply, sublime. Each time I cook a dish with a Poblano it feels like a celebration, as if I were right there in Puebla, but the party just happens to unfold inside of my home. If you can’t get to Puebla anytime soon, try this soup for a Cinco de Mayo moment, be it Cinco or not. 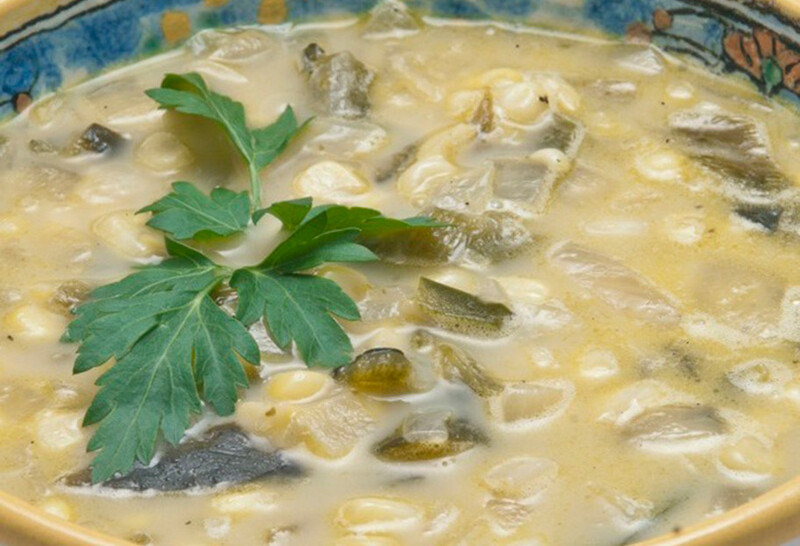 Article written for and published by NBC Latino, poblano soup photo by Jack Foley. Place a large soup pot over medium heat; add oil and butter. Once the butter melts and begins to sizzle, add the onion. Cook the mixture, stirring occasionally, until the onions have completely softened, everything is cooked through and the edges turn slightly brown (about 10 minutes total). Add the poblano chiles, stir and let them cook along with the onion for 3 to 4 minutes. Make some room in the middle of the pot; add the corn and sprinkle the salt and pepper. Let everything cook, stirring occasionally, for another 3 to 4 minutes. Pour in the chicken broth. Let it come to a simmer and cook for 3 to 4 additional minutes so the flavors start to blend. Reduce the heat to low, wait for about a minute, and slowly pour in the milk. Heat the soup thoroughly for about 6 to 8 minutes, without letting it simmer or boil (if you do, it will appear curdled but still taste fine). Serve hot. Makes about 5 cups. This is so easy and so delicious! I’m used to chiles but this was actually hotter than I anticipated. Fortunately we had some creme fraiche to serve with it. I’m glad you liked it Pria! You are my FAVORITE cook! You are so up there with Vivian Howard!!! I have watched all your episodes on Amazon and purchased your cookbooks. Not only that, but my daughters and I have created a cooking community where we meet once a week and try one of your recipes live! Thank you for sharing and allowing us to come closer together as a family. Wow that’s awesome that you meet up once a week to try a recipe! That sounds like so much fun. Please say hi to all your daughters for me at the next meeting! I made this soup and replaced the corn with riced cauliflower and added diced chorizo so yummy. So glad you made it your own! I love this soup Patti! We have it for dinner, but I do add some cubed potato for some added body. We love it! So glad you love it Melissa! I’ve had the recipe hiding in my notes since the day I watched the episode on tv, yesterday my daughter and I saw and nabbed poblanos and corn on the cob as our “extras” while grocery shopping. Today I made a batch of the soup. We r in LLOOOVVVVEEEEEEE ❤️❤️ It’s soooo good, spicy yes but the goat cheese sweetens it right up! Ty for creating and sharing this recipe! YUM! Tabitha, I’m super happy you and your daughter loved the soup! hi patty……………..very easy and every good…..my family love it…….thank you very much…….. I need to try this receipt. Thank you for sharing it. If all possible could you make video on how to make Creamy Queso Poblano Soup. Thank You. I hope you do try it! Good idea to make a video. I will try to post one soon. Pati…watching your Create show…love your recipes! Esp the Barbacoa! This looks so good. I am excited to try it. Thank you for the recipe and the history! Thank you for this wonderful recipe. As to the cinco de mayo early celebrations, it is not difficult to explain if one desires to understand the the history of Mexicanos in the United States and their role in self determination and civil rights. Research, as done with food, brings with it a wealth of knowledge. I agree! And I am so happy you liked the recipe! I’m thrilled to have found you on TV. I love all of your recipes, especially your tacos and main dishes. One I would love to have is your salmon that was shown on July 27th. I believe the salmon isn’t cooked but marinated in an extraordinary recipe of salsa. As you said during the program “you could feed the whole neighborhood with this salmon recipe. I particularly like your advice saying buy a quality piece of salmon. My best wishes for your continued success. I just wanna say that I am sooooooo grateful to have found you, your cooking, and your blog. Your recipes have helped me to get in touch with my Mexican heritage. Of all mis amigas y primos, I’m the only 20-something that has interest in making the dishes from scratch ( though the others don’t mind eating them!). Your recipes give me culinary inspiration and something to work towards. They make me feel closer to my grandfather and great aunt, who are from Guanajuato, and my grandmother and great aunt, who are from Monterrey. I also enjoy when you explore cultural mash-ups, like French-mex, and your mexicanized American food! In the future, I hope you’ll do more of that direction. This soup is one of my favorites, a definite go-to for me. It’s like a cup of comfort in cold weather, and so simple to make! In the other comments, I saw a question about coconut milk, and I would like to confirm that it works splendidly! A word of caution, though. The flavor you’ll get depends on the brand of coconut milk you buy. Each brand is different. Some are sweeter than others, some are better blended, some have more coconut oil than others(makes them richer), and some have more coconut water/are watered down. You’ll know after a bit of trial and error which brand works for you. Recently, I added black beans to the soup, for more heartiness. They work well with the corn! Am thinking about chicken in the future, but not sure yet…. I also have some requests. After a period of cooking, I got up the nerve to make flour tortillas from scratch, and they were delicious! But they were nothing like tortillas from the panaderias, or like you’d get from the street vendors. Do you think you could do a recipe for those? Maybe corn ones too? My corn tortillas are a total flop 🙁 ….. And some recipes for conchas and panderia-style galletas would be great! Ooooh, and atole! Of course, I’m always looking forward to your next post/show, and can’t wait for the new season! What day will it start? Keep cooking and embracing your Mexican heritage. My new season starts in April. Hey Pati! Gracias para las recetes. They helped immensely, and my cooking is now Tia grande approved! Love love LOVE the new season. My Grandfather’s side of the family is from Guanajuato (specifically San Miguel), and though I’ve never been there before, I cling to your episodes like a window to my family history. This season has helped me to understand some of our personal family traditions and why we do some of the thing we do and like some of the things we like. I especially feel justified in my love of mangoes! Please keep doing what you’re doing, because you’re changing lives. On a side note, I would also like to let you know that my great aunt adores you! She watches your show regularly, and would rather watch you and Perry Mason than the prime time shows any day. I told her about how you interact with your fans and how dedicated you are to your craft, and she thinks the world of you. She’s in end-stage liver disease, but I have been able to cook most of your recipes with little to no modification, and it makes her day. We have bonded over your show and recipes, and I would really like to thank you for that <3. I made this soup and it was great, very comforting on a cold day. But mine didn’t seem to get a thick and creamy as yours on the show. I used 2% milk. Any suggestions? Hi Pati, loved the soup! How can I make it spicier? Use a jalapeno? So glad you liked it! Si! You may try adding a jalapeno. Would using some of the seeds from the poblanos work? Just writing to you to congratulate you on your program and to thank you for your contribution on the history of Mexican food! I’m a fellow “chilango” (raised in Mexico City) and a fellow Texan (I live in Austin), and I love your program and the background you give on Mexican cuisine. I belong to an artistic movement called “Steampunk,” which basically means we are fans of historical-based science-fiction, like Jules Verne’s novels and the Wild Wild West movies, so we build contraptions and write novels and games in the style of 19th. century sci-fi. This last 5th of May, at the Brassgoggles forum, I de-mystified the “Cinco de Mayo” celebrations (Battle of Puebla), and it was the perfect opportunity to talk about the French Intervention, the Maximilian period, Benito Juarez, and naturally “French-Mex” food, as this is an interesting part of Mexican history (see web-link above – you can publish that). In any case, just wanted to comment on it and thank you for your effort in spreading the word about Mexican food! In addition to the poblanos, I quickly seared some dried peppers and let them soak in the chicken broth and then blended it smooth before adding it, and also added some shredded chicken. Very delicious on a cold Colorado afternoon! Hmm, sounds super good! Thank you for sharing with all of us!! Hi pati! Mom’s been under the weather and has requested a corn chowder for tomorrow but I would like try this instead. Seems a bit lighter than a chowder. Do you think roasting the corn rather than boiling it would change the soup too much? Is there a protien or other sides you think can go well with this soup? This soup is so delicious. Here in Colorado, it’s easy to find the chilis already roasted.I added a little cubed potato in mine and it was really good. This recipe is easy and takes so little time. Just the right amount of heat for a chilly day. Very difficult to buy fresh Poblano in eastern Canada. I do have the dried form “Ancho”. Can it be substituted? Thank you, great Blog. That will change the soup completely. Can you find fresh Anaheim? You can also use Green Bell Peppers, not the same flavor at all, but will be tasty as well. Since retiring, my wife and I have gotten into much more cooking and she is especially loving Mexican recipes. (Me too) We will be making this soup in the next few days and look forward to it. Where do you find poblanos with heat? We have gotten them from several different grocery stores and they are good, but taste more like bell peppers, no heat, and we like it spicey. Are we doing something wrong? Would the dehydrated peppers be better? 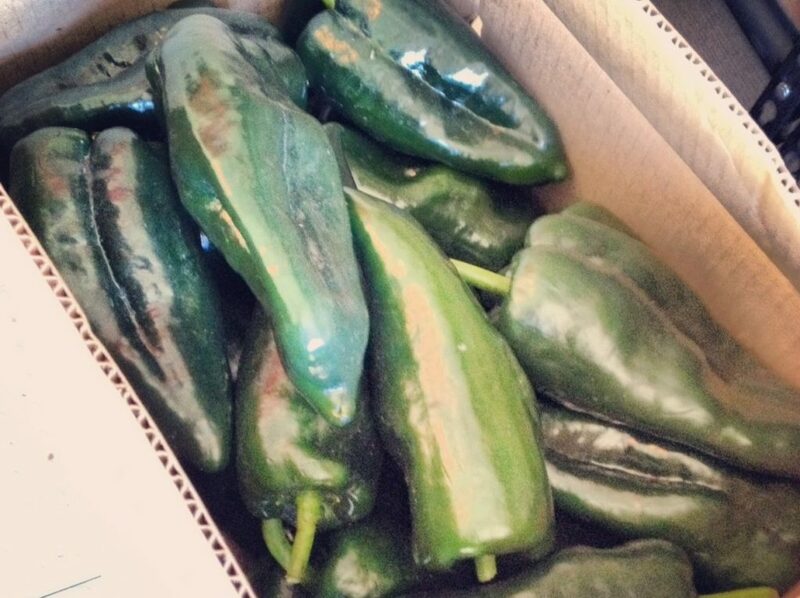 Hola Daniel, Poblano chiles range from very mild to very hot, and it’s hard to say what you are going to end up with. Use fresh poblanos for the soup and leave in the stems and seeds if you want more heat. Just made the soup. We loved it. I love your show too. Love your recipes, your show & your accent. Keep up the good work!! Me too!! Thank you, Jackie! Thank you for your delightful cooking show. Your personality lights up my day and thank you for this site as I can look up the wonderful recipes, as I am not able to write as fast as the show goes. Thank you so much for watching, Maria!! And thank you for watching the show! You are so wonderful. I love you & Learn so much from you. You are truly, truly wonderful. Just so much good cooking! Roberta, You are so kind. Thank you!! I caught your show yesterday, and the Poblano soup looks great, I guess I was thinking about it a lot, I dreamt of making it last night! I can’t wait. Hola Vicki!! That is so funny that you dreamt about the soup! I think it means you will have to make it soon. Let me know how it turns out. Your tip of roasting the chiles in the oven is the best. I used to do it the primitive way. No more! Thanks! Hi Dora, I’m glad you found my method helpful! Thank you for writing in!! If I get the soup to hot from the chilis how to you get done of the gear taste(flavor) out? I know you said it on the show but I can’t remember. Hola Robin, a great way to tame the chiles is to soak them in hot water with ab it of brown sugar. But if the soup is already made, the best thing is to add more milk, more broth and a bit more of corn.. Thank you so much, Vic!! Love your show, you are awesome! You make Mexican food sound exciting and accessible! Each episode leaves me hungry and wishing I could make that recipe immediately. Alas with a 3 month baby at home plans dont always work out! Inspired by few of your shows I now have some tomatillos and poblano chiles in my fridge. I have a dinner to plan for this weekend so I am wondering I could use this soup recipe with a twist? Of course you can, Nila!! Let me know how it turns out! I added roasted tomatillos to the recipe and it turned out great! I served it hot with a sprinkle of queso fresco cheese and it tasted good! Can’t wait to try your other recipes! Thanks! I love watching your show. I love this soup. I added ahredded chicken because its just my wife and me. it was an incredible one dish meal. I’m making it a second time and saw other recipes that add garlic and puree the pepper. What do you think? I’d like to puree some of the mixture of garlic onions and poblano. I’m using six poblanos and adding a 1/2 a onion which would give me about a 1/2 a cup of puree to add to the stock. I don’t want to ruin but rather enhance. I love your Matzah Ball soup as well. Do you have anyother Mexican dishes I can use for Passover. No such thing as Mexican Tzimmes. Right? Hi Richard, Thank you so much for watching the show! Of course you can experiment with the poblano soup by adding garlic and pureeing with some of the onions and poblanos. The puree may alter the consistency of the soup, so adjust your amount of stock to make it thicker or thinner. Also, careful with the garlic, it can easily overpower so no more than a few cloves. Other than the Matzo Ball soup, Flourless Almond Porto Cake is also great for Passover: http://patijinich.com/2010/03/flourless_almond_cake/. All the best to you! I made this soup and it is not only so easy but SO delicious! Unlike other soups, the prep time is minimal since there are only few ingredients. I also didnt add any milk and it was perfectly creamy on its own! Thanks Pati for this wonderful recipe, I absolutely love your show and I am so happy you post these delicious recipes on your website as well! This is a delicious soup! I went to Barnes & Noble to buy your book today, and they said it isn’t released until March! 🙁 Well, anyway, I’m a fan! I also reserved your book with Barnes and Noble. I love your show. You explain things thoroughly . I love trying new foods….plan to buy chayote soon. Your recipes are fantastic and like others I can practically taste them as I watch your show. I live in Northern NM and love the food here but your recipes take it to a different level. About soyrizo. I use it and like it but it is not as spicy or tasty as the real thing, chorizo. I can’t wait til I get your book. When I watch your show I have to tell you that it is also a comfort zone for me. I am learning so much from you and I can listen to your show all day…..its a comforting feeling that is hard to explain. Its your style and its great! I watched a show where you took corn tortillas and made chips of them and then baked them. A sauce was made in the blender from using tomatillos and some other ingredients. I looked on your list of recipes, and could not find this one. I forget the name of it, but thought it would be a very good way to use corn tortillas that my son left at my house. It could had been a soup, however, I don’t recall. Could you please email me this recipe? Hola Tom, I believe the recipe you are looking for is Green Chilaquiles in Roasted Tomatillo Sauce: http://patijinich.com/2012/10/green-chilaquiles-in-roasted-tomatillo-sauce.html. Thank you very much for watching the show!!! I love to watch your show. You make me want to get busy cooking. Your recipes are easy to understand and I can almost taste it as you explain it. I have a grandaughter who is part hispanic and of course, she is just beautiful. I also love your web page. You have so much to share and you don’t mind sharing your recipes. I want to thank you. I will let you know when I try to cook some of your dishes. I plan to try them out on Marcos, my son-in-law, who is hispanic. He came to America from the Vera Cruz area. He wants my daughter to learn how to cook more Mexican dishes so I told her about your show. So long for now. I will talk to you again soon. program. History information, your personality. Great recepies! Hola Tomasa, You are too kind! I am so happy you enjoy the program. Thank you so much for watching. This is a simple soup, but it’s soooo delicious! The spicy poblanos and sweet corn are perfect together. I’ll be making this often. Thanks! Hola Teresa, I’m so glad you tried the poblano soup recipe! Thank you for letting me know it turned out well. Will almond milk work in the recipe? I only buy almond milk for my lactose intolerant family. I made your Chicken with Tomatillos, Onions and Piloncillo and your Chopped Salad with Avocado, Corn and Hearts of Palm the other night. Both were hits at the table. I knew you had it going on when I began to read your recipes. The recipes you provide are balanced in flavor and delicious. I will be cooking from your website all summer long. Hola Liz, I am so glad you loved the recipes you made so far! I hope you continue to enjoy them, and if you have any requests, just let me know! I am 74 and retired last year. I can’t afford to go to my favorite restaurant as often as I used to so I am trying to learn how to prepare my favorites and some new dishes. I love, love, love your show on PBS. You are a great teacher explaining the ingredients etc. Your food looks amazing and I want to do it too now. Your tomatillo show was great. You showed how easy it is to prepare them in a salsa and with chicken. Thank you. I love salsa verde on lots of things. I tried mixing it with avocado and crema and drizzle it on eggs and enchiladas. Wonderful. Much better than the bottled that I thought was so tasty. Hola Sandie, Thank you so much for your lovely comment! I am so happy you love love the show and the recipes. I love salsa verde too and putting it on many dishes :). If you ever have any recipe requests, just let me know! I have fallen in love with your blog and your show and absolutely all of your recipes. I am on a mad hunt to find the Chiles en Nogada recipe. I first tasted it at my madre’s friend house and i thought i must have this recipe. What are your thoughts…I am still researching and I was wondering if you have your own recipe for Chiles en Nogada. Hola Olga, Yes, I have a Chiles en Nogada recipe! Here it is http://patijinich.com/2009/09/chiles-en-nogada-at-last.html. Enjoy! Pati, Your show on PBS is awesome.Your receipes are so simple and look delicious. I love to watch you work. Wish you were on more. Gracias por tus bellas recetas que ponen el arte culinario de México en el escenario. Es verdad que mientras mÃ¡s estamos lejos de nuestro México querido, mÃ¡s queremos recordarlo. Por favor continua deleitÃ¡ndonos con tus recetas. Feliz 5 de mayo! 🙂 I’m making this delicious soup this Saturday! I love your recipes and your photos!!! I want to make a painting of your photos!!! These words of yours are beautiful!!! “These words fluff up like soft conchas right out of the oven, getting fluffier, sweeter and more comforting as the years go by.” Thank you for beautiful recipes, beautiful photos, and beautiful words!